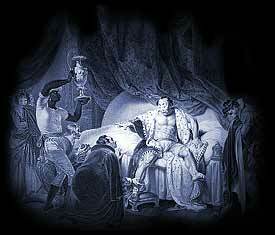 Picture - Christopher Sly is discovered in bed dressed in a rich robe by a group of attendants . The Lord is among them dressed as a servant "Taming of the Shrew." 1623. This section is dedicated to The Taming of the Shrew, the play by William Shakespeare. The picture is 18th century and image displayed represents the essence of the play which, we hope, will bring to life a famous scene or character from The Taming of the Shrew. The information provided in this section of william-shakespeare.info includes famous quotes / quotations from The Taming of the Shrew, summary of the plot or story, facts about the play, a list of the cast and characters and access to the full text - script of Taming of the Shrew the play by William Shakespeare. The beautiful and gentle Bianca has no shortage of admirers (Lucentio, Gremio and Hortensio) but her father insists that she will not marry until her shrewish sister, Katharina, is betrothed. Bianca's suitors persuade fortune-seeker Petruchio to court her. The suitors pay for any costs involved and there is also the goal of Katharina's dowry. Katharina into submission and he craftily denies her food and sleep, whilst continuously singing her praises. He also finds fault with her new clothes and she is forced to wear old ones. This is the final straw and Katharina starts agreeing and pleasing her husband - she has been tamed. On their return to Padua Lucentio has won Bianca and Hortensio has married a widow. At a banquet they wager on who has the most obedient wife. Each wife is issued with commands but only Katharina obeys and promptly lectures everyone on the importance of wifely submission! Theme of the play is a farcical comedy but the question is did Shakespeare really believe that a woman was in no way equal to a man or was this play tongue in cheek and was he portraying how men would simply like things to be! It is believed that The Taming of the Shrew was first performed between 1593 and 1594. In the Elizabethan era there was a huge demand for new entertainment and The Taming of the Shrew would have been produced immediately following the completion of the play. It is believed that The Taming of the Shrew was first printed in 1623 in the First Folio. As William Shakespeare clearly did not want his work published details of the play would have therefore been noted, and often pirated without his consent, following a performance. The quotes from the Taming of the Shrew are amongst Shakespeare's most famous including 'I 'll not budge an inch'. Details of this famous quotes follow, with others, complete with information regarding the Act and the Scene, allowing a quick reference to the section of the play that these quotations can be found in. Please click here for the full text of the script of the play. "I 'll not budge an inch". (Induction, Scene I). "Out of the jaws of death". Act III, Scene IV). "Thus the whirligig of time brings in his revenges". (Act V, Scene I). Unlike many of his other plays The Taming of the Shrew does not include any historical figures or events. In the sixteenth century shrewish wives were, however, featured in a number of plays.